Experience the best Salmon Fishing in the World with Braedy Mack Fishing Charters. You won’t be disappointed. Most of our salmon fishing is done at the offshore banks about 10 -12 miles where trolling is the method of choice. Covering more ground in a short amount of time means maximization of your fishing time. We have all of the necessary tools, whether it be artificial or anchovy and herring to ensure we get fish on our lines. July and August give us some options along the rock piles and protected waters of Tofino & Ucleulet area for the large salmon feeding in this area. We Guarantee to catch Salmon in Tofino, in our offshore West Coast, Vancouver Island fishing charters. Call us TOLL FREE at 1-888-732-3077 for specials & availability. *Check with Jeff the Captain for Department of Fishery updates. Salmon Fishing Tofino & Ucluelet on the West Coast of Vancouver Island BC is a world class location to intercept massive concentrations of feeding salmon and halibut. Our local waters are feeding grounds with large bait balls for the feeding schools of Chinooks and Coho Salmon. The consistencies of the depth on the offshore banks make the fishing around Tofino & Ucluelet one of the premium spots on Vancouver Island for Salmon Fishing. These vigorous Salmon put up some of the very best fights especially on the right gear. 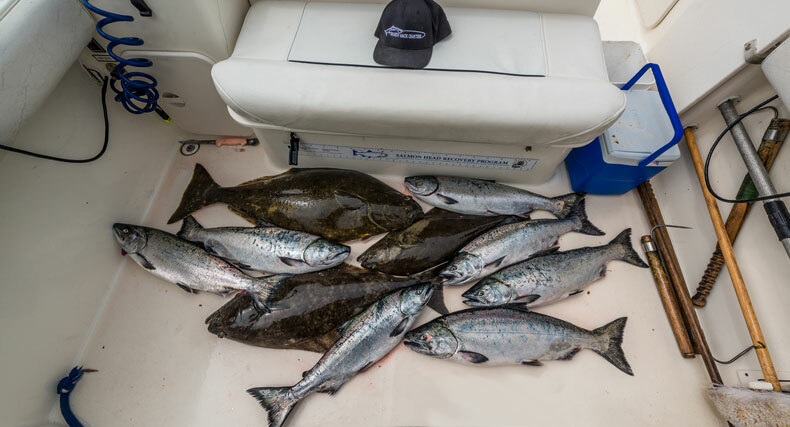 Braedy Mack Charters Fishing Tofino uses Sage rods and Islander reels so you can feel those line melting runs that large Chinook and Coho like to take. Our top of the line gear is perfect for trolling or mooching. Check out the boat & gear. It is during this time that cut plug herring and strip can be used without down-riggers called mooching. This method can be a lot of fun and prove to outwit even the brightest Tyee. These Salmon can be ferocious eaters and when the bite comes on it is common to have multiple double headers in a trip. Screaming reels we call it. While out on the water, expect to see an abundance of sea life. Whales are a regular viewing opportunity. As they cruise by Vancouver Island to their winter feeding grounds. These large chinooks can leave your reel empty and the boat heading in the direction of the fish just to get some line back. Although Chinook are the most abundant, we do also get a lot of Coho showing up between June and October. Check out our rates & packages, for single day, two day and three day salmon fishing packages. Our salmon fishing charters are flexible, once you have caught your salmon possession limits for the day. We can continue sport fishing, go halibut fishing, view whales & wild life or visit the remote natural wilderness hot springs for relaxation.